Sneaky Ninja Kickstarter Update #15: 10 Days Left! Plans for Final Week and Final 24 Hours Livestream! So here we are, with just ten days left! We’re in a good position right now but we have a lot of ground to cover to reach our goal. The good news is, it’s very doable! The last week of a campaign is where most of the action happens, so we still have a very good chance! We just need to do a ton of work spreading the word and making sure everyone knows about it. Over 100 backers! And two weeks left!! A big big big thank you to everyone who’s brought us this far! We’re almost out of the dreaded mid-campaign slump where everything slows down, so now it’s time to kick things into overdrive to make sure we get funded! We’ll be appearing at a few local indie game events to reach as many new faces as we can, but you can get in on the word-spreading fun!Keep sharing with your friends and bugging them until they donate or share too! We’re in a decent place so far, but these last two weeks are absolutely vital to Sneaky Ninja’s success.Every bit of help is appreciated, no matter how small! This is another stretch goal that we’ll be trying to implement either way — we had been calling it “Social Features” everywhere else, but that tends to give people the wrong idea. We’re not trying to link to your Facebook account and post status updates about how many Samurai you snuck passed — we want to add social functionality where it actually matters: the gameplay! You can send letters to each other with items, coins, or accessories attached, to lend a helping hand or maybe share some rare loot you found! How Fortunate! A fortune teller in the hub can cast a one-use magical spell on you, like restoring your health when you lose all your hearts in a level, or turning you invisible right as you were about to get caught. You can also have one cast on a friend! They won’t know you did it until it saves them in a pinch, and they’ll have a “you’re welcome” letter waiting for them when they get back! Send different kinds of challenges to your friends, like speedrunning a level as fast as you can or slipping through a difficult level unseen. Feeling extra competitive? Wager some coins and rake it in when your friend can’t match your skills! We have a few other ideas that we’re a bit less ready to commit too, but it would be awesome to tackle them and see if we can do it. Like sharing replays of yourself completing a level, maybe — who knows? 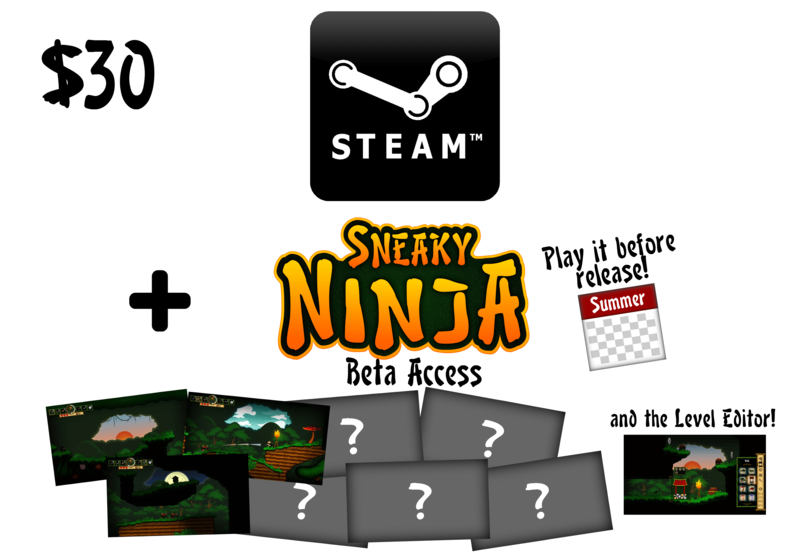 Sneaky Ninja Kickstarter Update #12: ALPHA and BETA ACCESS rewards added! We’re excited to announce two new reward tiers for all of you who can’t wait until the game’s out to get your hands on it — ALPHA and BETA ACCESS! With both of these rewards, you’ll get the game before anyone else does on Steam, plus the chance to have your voice heard and give feedback that goes straight back into improving the game! And if that’s not enough, get your name in the credits (again!) as Alpha Ninja and/or Beta Ninja! For $30, the Beta Access tier will get you… beta access! This is the version of the game when it’s close to being done but not quite there yet. You’ll get to play it a few months before release, and you’ll get a taste of the whole game by including at least one level from each world! Don’t worry, there won’t be spoilers — the full game will still have plenty of surprises for you to experience! It’s a peaceful ninja village deep in the forest, one of the few places still safe from theSamurai. This is where our heroes live and where you’ll return between levels to shop for more item supplies, upgrades, and accessories. Making a game for a wide audience is tough, since the gap in skill between the least and most skilled players you hope will enjoy your game can be huge. Difficulty modes are the go-to solution for accommodating players of all skill levels, but we didn’t want to stop there. We put some extra thought into giving you options to find the difficulty that’s juuuuuuust right for you! In a stealth game, there are few things more important than the way enemies behave. If they’re smart, they create a very challenging puzzle for players to solve and keep you on your toes trying to sneak by them. If they’re stupid, well, it might as well not be a stealth game! So we’re putting in a lot of effort towards having enemies that react intelligently to what’s going on around them and put up a fight instead of just standing there drooling as players walk right by. So far there are three types of enemy Samurai, and each kind changes the way you have to approach them. This is the normal Samurai, which is your standard guard; he patrols the area back and forth, keeping an eye out for anyone that might be lurking in the shadows or any signs of suspicious activity. He comes equipped with a katana to slice apart anyone he doesn’t like, and you don’t want to be caught on the business end of one in motion. His sword will swat away almost anything you throw at him while he’s chasing you, too. One thing that stealth games and platformers have in common is that they both need avariety of mechanics to keep them from getting stale; different things to hide in and different things to jump on are a must for interesting levels! So today we’ll take a look at some of the many ways you can interact with the environment, in terms of both being sneaky and being a circus acrobat. Also note: many of these are exclusive to the forest area , since each unique environmentcomes with their own unique mechanics too! The rest of the game will have plenty more! It’s time to reveal a little more about our plans for the Wii U version! Nintendo is a huge influence on us and Sneaky Ninja, so getting a release on Wii U has always been a big priority. That’s why you won’t find the Wii U as a stretch goal mysteriously $50k more than everything else — it’s part of the base goal! We’ve already been approved by Nintendo as an official Wii U developer, now we just need your help to make it happen! He’s a sensei who’s wise beyond his years – and trust us, he’s racked up plenty of years. Over his lifetime he’s mastered the art of sneakiness and reached a sort of enlightenmentthrough untold gallons and gallons of tea. Five days in and we’re now over 20% funded! That’s a big milestone, and a huge thanks goes out to everyone who’s donated so far! Please continue to share with your friends to help keep our momentum going! If you haven’t donated yet, well, you still have plenty of time — but donating sooner rather than later may help inspire more people to back us! Big thanks again to everyone, we can’t do it without you! She’s a natural-born warrior with a talent for any weapon she picks up. She’s a bit hot-headed and she isn’t exactly known for her patience, so you better hope you’re on the safe side of her arrows when she draws her bow. Make her mad and let’s just say she might accidentallyaim a little lower than the apple on top of your head.